Stir together Bisquick™ mix, milk and nutmeg in ungreased 8-inch square (2-quart) glass baking dish. Stir in butter until blended. Stir together sugar and peaches; spoon over batter. The texture of canned peaches is good for baking, they hold their shape and stay moist and sweet. The cobbler topping stays very tender and is especially good if sprinkled with coarse sugar and a pinch of ground ginger before baking. This is a great recipe to double and assemble ahead of time in a 3-quart baking casserole or 13x9-inch baking dish. Cover and refrigerate up to 24 hours, allowing the casserole to warm up a little before popping it into the oven. Grab a carton of pecan praline or cinnamon ice cream to top the warm cobbler. Cobbler is a dish that was born around the campfire, when those traveling West pulled together the ingredients they had on hand to make a satisfying dessert. Without access to rolling pins, baking ovens or pie tins, they put dried or preserved fruit in Dutch ovens, topped it off with biscuit dough and baked the mixture over an open fire until it was brown and bubbling. Even though it was an improvisation that was born through the hardship of the trail, cobbler has become a beloved, even iconic, dish. It’s less time-consuming to prepare than a pie, but it still has warm, fruity goodness for the perfect ending to a great meal. 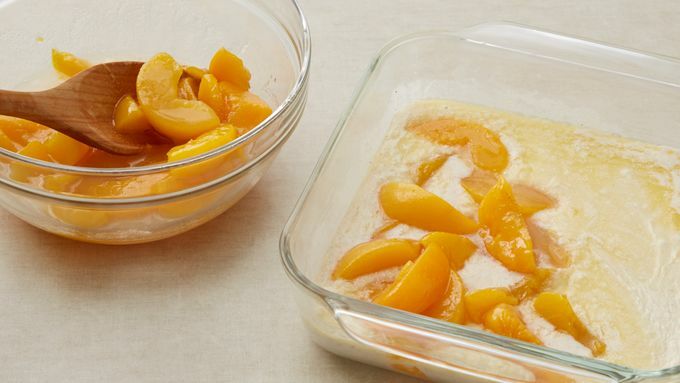 This peach cobbler couldn’t be easier to make, thanks to the time-saving convenience of Original Bisquick™ mix. 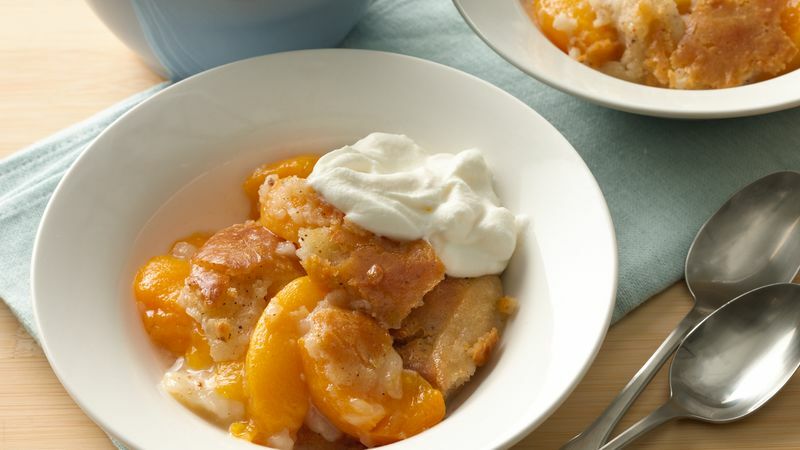 After you’ve made peach cobbler with Bisquick™ mix, explore the rest of Betty’s best peach cobbler and crisps.